Sure, Gibson worked hard and competed, as he usually does. But it was in the minutes after the game where Gibson stood up and declared his love for his team, his teammates and his adopted basketball city. With literally just minutes to go before the 11 p.m. (Central) deadline, Gibson agreed to a four-year contract extension with the Bulls. He said it was worth about $38 million, which is with potential incentives from a base in the low $30s. Gibson, who earlier in the evening admitted he was pessimistic about agreeing to an extension Wednesday, said his agent was confident he could earn a bigger deal if he waited until next summer. But Gibson said he decided more than $30 million is actually a lot of money, and Chicago and with the Bulls was where he wanted to be. And that life choice was more important that whatever extra he might brag about earning. “It’s all about whether you are happy or not,” said Gibson in a curiously rare admission for a pro athlete. “In the back of your head, you do want to see what else is out there. But then you don’t want to be in some hell hole somewhere chasing the bucks. Yes, Gibson probably could have played it out and earned a bigger contract, though there is that risk of a career ending injury and nothing. And Gibson did admit that weighed heavily on him, especially seeing Derrick Rose’s serious knee injury. There is always one team out there willing to make what seems like a ridiculous offer because they have gotten under the salary cap and can’t afford to come up empty. But what if you like where you are, like your teammates, like playing for the coach, love the city and its fans and know you are with a team that’s been highly successful and that it should be again once Rose recovers? So Gibson said “I do,” though it was not before an emotional postgame scene in which Gibson admitted he was in tears talking with Bulls executives Gar Forman and John Paxson. Gibson said they came to him minutes after the game, said they wanted Gibson to remain a Bull and be part of what they hope to continue to build. It was an agonizing process for Gibson, who like most players was pulled from side to side by friends and associates about what to do. He admitted many said to hold out to get more. But Gibson also said he relied on his Chicago-based agent Mark Bartelstein, who, in the end, Gibson said advised him it was too much of a risk to pass up so much money. “I don’t want to be a selfish player,” Gibson said. “I just wanted what was fair. I looked at the numbers. It’s a lot of money. You can’t really turn down that much money, especially for security and you can’t tell what will happen throughout the year. My agent, he’s great. He talked to me like a father. I asked him what to do. 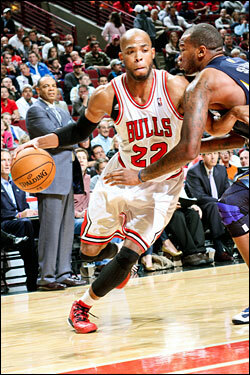 Which Gibson did somewhat dramatically as the Bulls then rushed to beat the league deadline. And as Gibson was being surrounded by reporters after the game, it was clear his teammates were thrilled. “No, I’m not,” Gibson interrupted with a laugh. “Taj-a-woo,” Joakim Noah, who was superlative in the game with 23 points, 10 rebounds and five steals, bellowed from the shower. “Wooo, wooo,” Noah kept yelling as Gibson finished the interviews. It turns out Gibson gets it, perhaps more than most professional athletes. Good friends, good fun, good competition and good money. It makes sense. Those are the kinds of players you want because that’s how you become a winner. Not chasing dollars but chasing happiness and success.